Add ad custom Spray Foam Box or Cart to your fleet and tackle jobs that a a large spray foam rig can not reach. Paratus Supply's XTR1 Series of spray foam rigs are great for stud cavities, attics, and crawl spaces, and concrete leveling. 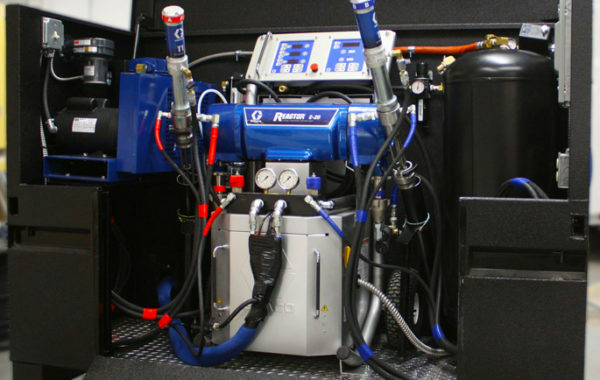 Take on any spray foam application with a Paratus Supply XTR2 or XTR3 Commercail Spray Foam Rig. What are Spray Foam Rigs? 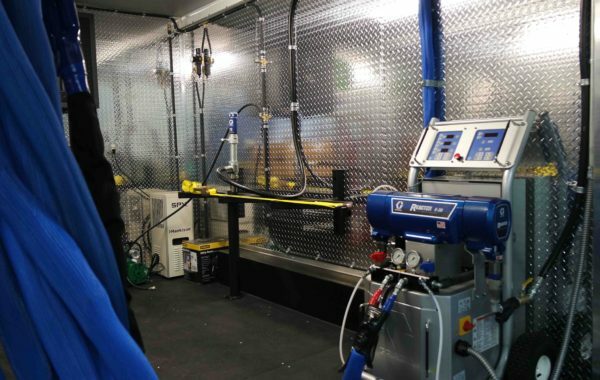 Paratus Supply prides itself on building the highest quality turnkey spray foam rigs known to the industry. 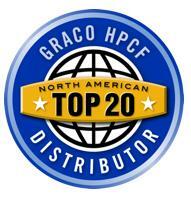 Our quality technicians will help you determine your spray foam equipment needs and support you every step of the way. A spray foam rig is a manufactured trailer or box truck that is put together for a contractor to be completely turnkey. It allows for the spray foam contractor to show up at a jobsite flip a couple switches and begin the application process. 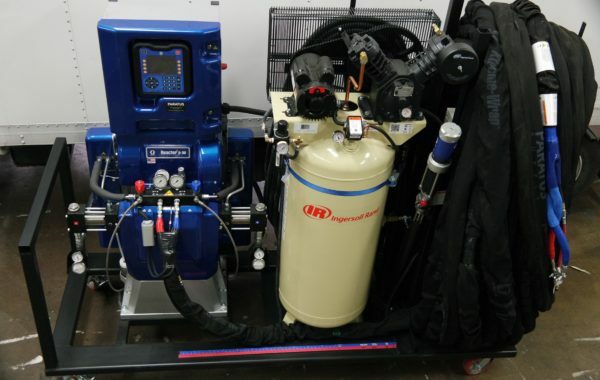 Turnkey spray foam rigs consist of a Generator, Compressor, Air Dryer, Proportioning Machine (Reactor), Heated Hose, Transfer Pumps, and Gun. A quality Spray Foam Rig will be laid out so that the weight distribution of the component are balanced, allowing for a safe and smooth tow. Since the spray foam rig is the applicators work space, a well laid out rig will usually include a good barrel bracing system to safely transport chemicals. 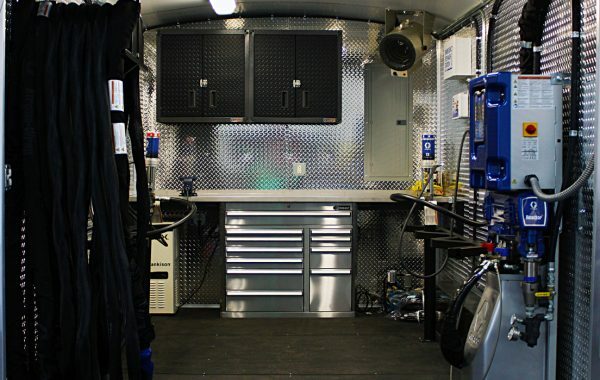 Tool boxes, cabinets, and work bench will assist with storing tools and supplies in an organized manner. A Spray Foam Trailer or Spray Foam Box Truck should be heated and well insulated, using closed cell spray foam insulation. Safety equipment should be included such as: Fresh Air Breathing, Eye Wash, First Aid, and Fire Extinguishers. Other tools such as Mixers, Cutters, Bung Wrench, and Drum Dolly may also be needed depending on the type of spray foam being processed. These things have weight and need to be calculated when determining the correct Spray Foam Trailer size and GVWR. If the Spray Foam Rig is undersized and overweight there will be many expensive issues. Height of the interior is extremely important so transfer pumps can be removed with ease. The strength of the Spray Foam Trailer starts with the frame and is best to have a 2” x 6” steel main frame and not C channel. Axels are also extremely important; torsion axels are going to allow for a better tow and last longer. A narrow trailer is going to limit maneuverability inside the rig. An 8’ width is recommended. Selecting the proper Proportioner or (Reactor) is key . The Proportioner (Reactor) will determine all the rest of the components needed to make sure that the Spray Foam rig runs smoothly during its life in production. Heater size of the proportioner and air compressor will determine the size of the generator or shore power requirements. The generator will determine the size of the Spray Foam Trailer. Do it right the first time at a higher cost will save you money down the road. If corners are cut to save a little money in the beginning, fixing the problems that will arise later will cost far more than the initial savings. This will also have a lasting view of your company when you are not able to complete your jobs in the expected time. If you have a lower budget contact us to see what Used Spray Foam Equipment or Rigs we have in stock. Cutting out the unnecessary downtime will help your business prosper. Each type of machine has specific output maximums or flow rates and heating capabilities. Machines with limited heating capacities may require the materials to be warmer than 65°F. Heating capability is also affected by mix chamber selection. Oversized mix chambers increase flow rate reducing the heating capability of the machine. In cold weather applications, mix chamber selection is critical to the performance of the system being applied. Effects of Temperature on Reactivity and Foam Quality. Greater pressure and variation on the gauges. 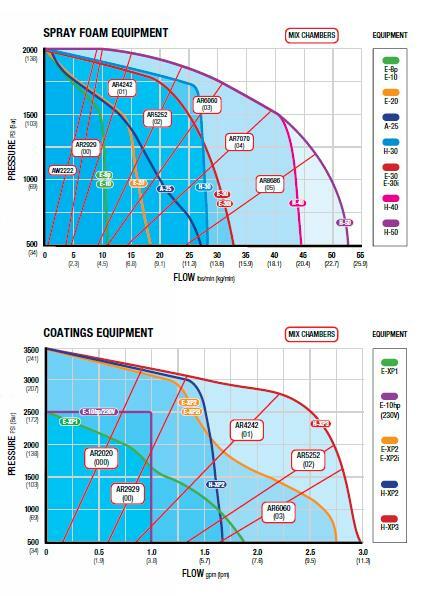 “A” and “B” pre-heat settings and hose temperature will reduce time and tip or chamber cleaning during the application. The foam produced from an optimized configuration will be of higher quality resulting Improved yield and fewer processing issues.